I recently became aware of a French photographer by the name of Michael Levy who runs a website called ‘International-Photographer‘. Michael has produced a map of Iceland specifically for photographers and was selling limited edition copies via his website. 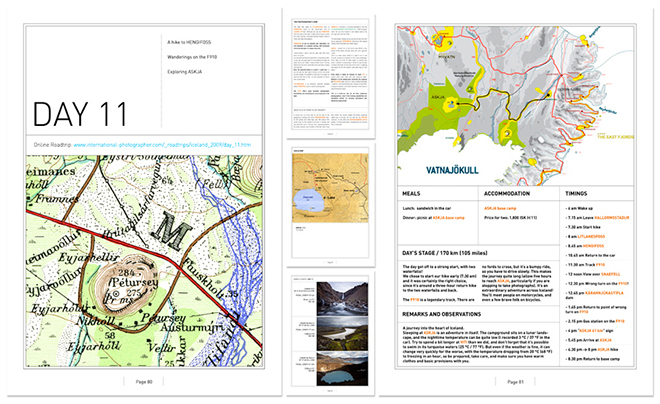 Curious for all things Iceland and photography related I contacted Michael via email and after some brief correspondance he kindly offered to send me a copy of the map for review. Before I dive into reviewing the map though a little history is in order. I have been to Iceland many times and have travelled from one end of the island to the other. I have circumnavigated the island by 4-wheel drive and driven through the highland interior both solo and with a guide. I have stayed in hotels and guesthouses around the island as well as camped by the side of the road. I have hiked mountains in Landmannalaugar and wandered around the geothermal mud pits of Þeistareykir. As of next year I will have spent over four months in the country and will have experienced both summer and winter seasons on multiple occasions over a period of several years. Each one of my trips to Iceland has been dedicated to photography and even so I feel I am just scratching the surface of what this amazing country has to offer for the intrepid photographer. To be upfront, I am a huge proponent of using local guides whenever I am in a foreign country and this includes the workshops and expeditions I lead to Iceland and other countries. An experienced local guide can offer intimate local knowledge of not only locations, but also and perhaps more importantly weather conditions. There is nothing more frustrating than arriving at a spectacular location only to be shut down because of bad weather. Iceland is a country where the weather can change incredibly fast. It can be brilliant sunshine and pouring rain five minutes down the road. No map, no matter how good, can possibly replace a local guide with local experience. If you are planning a trip to Iceland for photography I strongly encourage you to join a workshop (It doesn’t necessarily have to be one of mine) that employs a local guide who has the experience to read the weather to put you in the best locations at the best possible times; when the light is magical. Without belaboring the point local guides will frequently be able to take you to ‘secret’ or relatively unknown locations that are not marked on maps and that quite often are no less spectacular (and often more so). I have on many occasions been taken to locations I simply would never have found without my local guides. With that said, I am going to review this map from the point of view of those photographers who may be planning a self-drive tour without a local guide since this is likely who the map will most benefit and appeal to. This first edition of the map reportedly took two years of work from concept to printing and was created entirely by hand (not from a database) and will I am told be regularly updated. From the International Photographer website: The map shows essential route information, detailed descriptions of all areas of interest (volcanoes, waterfalls, lighthouses, monuments, fauna, flora and curiosities) as well as national parks and nature reserves. Not only can you now prepare your trip in detail, thanks to this handy map, but there’s no chance of missing anything exciting once you get there! The map itself is printed on 120 gram matt paper (double sided) and measures 980mm x 680mm (38 1/2 x 26 1/2 inches) when fully opened. 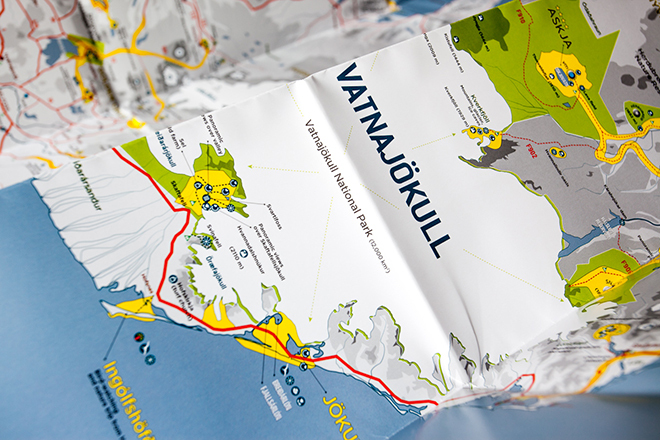 Folded, it measures 120mm x 22mm (4 1/2 x 9 inches) and will fit in a standard map pocket or sleeve. The second side of the map is devoted to a photograph of ice on the beach at the Jökulsárlón glacial lagoon and the latitude and longitude co-ordinates of this remarkable location. This first edition of the map is limited to 1,000 copies and was printed in France. Kudos to Michael for having the map printed locally in his home country. I applaud photographers who print their books and work in their home country and resist the urge to outsource to China and other mass-producing countries. Producing a map for photographers of a country so rich in photographic locations and subjects is a daunting challenge and Michael is to be commended for his hard work and dedication in seeing the project through to completion. The map itself is professionally produced and easy to read. Various symbols have been used to denote certain geographical features, flora, fauna, waterfalls and areas of interest etc. and are well documented on the key / legend. Also included is a basic day/night length cycle chart in the top right hand corner, scale 1:600 000 and a small map in the lower right showing the main highway one circumnavigation route of 1,339 kilometers. I would have liked to see geographical contours added to the map as there is a lot of potential hiking and walking in Iceland (particularly in the Highland regions) and being able to read the grade and elevation would be useful in these locations. I am however very pleased to see that camp grounds have been included on the map and are suitably denoted in the key / legend. You can more or less camp anywhere in Iceland; however, there are times when it is nice to stop by a dedicated camp ground to grab a shower, refill water bottles and re-supply. I was very pleased to see that locations that are not to be missed are noted with a star rating. Such locations include the incredible Jökulsárlón glacial lagoon, the volcanic area of Askja and the sea stacks at Vik as but a few examples. – What vehicle should i hire? – Which way round should i go? – Where are the best places to photograph (sea)birds? – How long does it take to explore the key sites? – When is the best time of day to photograph them? – Making a panorama My only real gripe with the map is that there is currently no digital version (especially given the e-roadbook is available as a digital download). 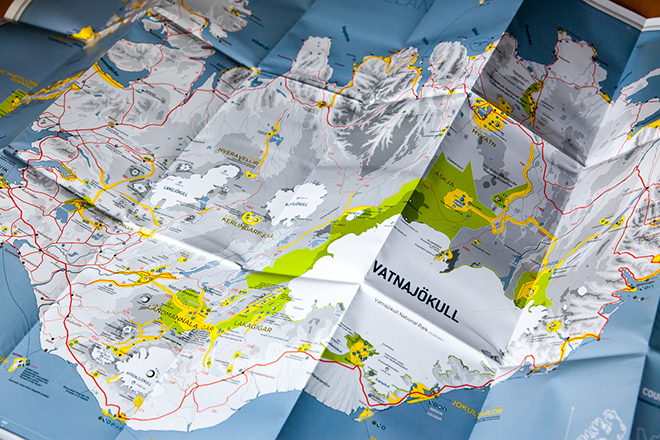 I would like to see a digital download version for photographers who do not wish to carry a traditional paper map with them into the field (especially in Iceland where it frequently rains). Photographers are some of the fastest adopters of digital technology and I don’t think there is a serious photographer out there who does not own a tablet device (or phone) of some description that cannot store and display digital map files in the field. I would also like to see GPS co-ordinates added to the map in a future digital edition for photographers who prefer to work with a digital map and a set of co-ordinates for finding a given location. Geo-tagged maps are starting to become quite popular with photographers and there are now a number of photographers producing (and selling) geo-tagged maps of iconic locations in America as an example. At 20 UK Pounds plus freight for those who live outside of Europe this is not an inexpensive map to purchase. However, it is important to remember that this map was a hand created labor of love that is printed in limited quantities (1000) in the photographers home country of France. It is to my knowledge a unique effort to provide a single map of photographic locations in Iceland and should be considered as such when deciding whether to purchase. For the photographer travelling to Iceland for the first time this map will likely prove invaluable as it provides sufficient information to plan a self drive tour and covers virtually all of the major iconic locations you are likely to want to visit as well as ensuring you don’t miss the ones that are somewhat harder to find. In combination with something like the Lonely Planet Guide to Iceland and Michael’s e-roadbook to Iceland it will provide a great launching pad for an exciting photographic tour of discovery. I suspect even photographers travelling in groups or with guides will find this map useful as it provides an easy to read and follow reference as you drive around the island. I will personally carry and use it on my own workshops and expeditions so that I can easily illustrate where we are in Iceland to those in the group. I expect we will see more of these maps in the future as the back side of the Iceland map also mentions other titles coming in 2012 / 2013 including Argentina, Australia, Canada, Eastern Europe, France, Italy, Japan, New Zealand, Russia, Scotland, Span and the USA. I particularly look forward to reviewing the map of my home country of Australia and my back yard New Zealand. Footnote: Michael tells me that a digital download version of the map may be offered in the future. Previous: Previous post: 2013: Whats in Store?